General Information About "Blog Expert" wordpress Theme Thank you for purchasing our theme. We are happy that you are one of our customers and we assure you won't be disappointed. We do our best to produce top notch themes with great functionality, premium designs and human readable code. Before you get started we highly encourage you to get familiar with this documentation file. Spending half an hour reading the manual may save lot's of your time and avoid questions with obvious answers. We also recommend to check our Knowledge-base and FAQ pages If you have any questions that are beyond the scope of this help file, please feel free to post your questions on our support forum. PLEASE NOTICE! Our support covers getting setup, trouble using any features, and any bug fixes that may arise. Unfortunately we cannot provide support for customizations or 3rd party plugins for free. If you need help with customizations of your theme then you should enlist the help of our professional team. Choose Upload theme option. Click on Browse…(Choose file in Safari/Chrome), select the “blog-expert.X.X.X.zip” (X denotes version no) and click in Install Now button. 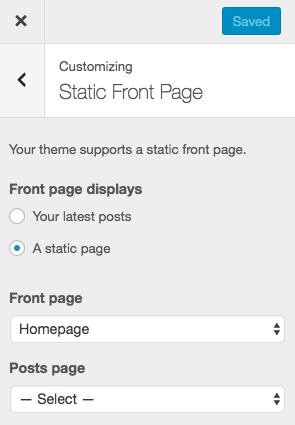 After adding a new page to your site in WordPress, it's easy to add it to the navigation menu. Click Menus, and then click Primary. Click the + icon next to the page you want to add, and then drag it to the appropriate location. You can add it as a sub menu item by dragging it to adjust its position. We've used default Wordpress menu options to add Social icons. If you're familiar with "WORDPRESS" menu options then its relatively easy task for you. To create a custom menu is actually really simple. 1. Login to the WordPress Dashboard. 2. From the 'Appearance' menu on the left-hand side of the Dashboard, select the 'Menus' option to bring up the Menu Editor. 3. Select Create a new menu at the top of the page 4. Enter a name for your new menu in the Menu Name box 5. Click the Create Menu button. After the menu has been created You've to add social site URL and Link Text from Custom Links sections and click OK: Important: Please add full URL (e.g http://www.facebook.com/username) for site URL on Custom Links sections.